Lake Ilo’s springtime green is evident this spring. It’s quiet, well-groomed and wild. Peaceful Lake Ilo National Wildlife Refuge is where you can stroll a nature trail, enjoy a picnic, watch birds, or try your hand at fishing. It’s what a small number of visitors are doing at the central Dunn County attraction, and there’s room for more. “People tell me they think it’s a hidden treasure, a place they like to go to relax and enjoy,” said Todd Gallion, the Lake Ilo Station Manager. Gallion is from Ohio and worked at Lake Ilo temporarily, then went back to school. He liked it here so much, he became the full-time Wildlife Resource Specialist or Station Manager. He is the only employee and does all the maintenance, visitor services, plant management, and law enforcement. “It’s very rewarding. I get to work with the local community, the Dunn County Park Board. I like to educate people about the wildlife here,” he said. Archaeologists have uncovered thousands of years of history at Lake Ilo. The Nature Trail takes visitors past a centuries-old tipi ring. The centerpiece of the Lake Ilo National Wildlife Refuge is the lake. It’s a manmade lake, damming up the confluence of two creeks, Spring Creek from the north and Murphy Creek from the southwest. The Federal Government built the dam through Works Progress Administration in the mid-1930. It became the first major lake in Western North Dakota. Then, Franklin D. Roosevelt established Lake Ilo National Wildlife Refuge as a breeding ground for migratory birds and other wildlife. The refuge is just over 4,000 acres and the lake is about one-quarter of that at 1,240 acres. Much of the shoreline is open to shore fishing. Boats at idle speed can get out in the water. In order not to disturb wildlife, recreational water sports are not allowed. Gallion said the refuge attracts bird watcher from across the United State. In the spring and fall, massive movements of migratory birds is like a magnet to bird watchers. All summer, warblers are easy for bird watchers to spot, photograph and record. Songbirds include the western meadowlark, bobolink, and several native sparrows. A variety of prairie hawks, deer, and pheasants also attract people to the quiet oasis. Large concentrations of waterfowl can be spotted at Lake Ilo. Great Canada Geese, mallards, pintails, teal are easily spotted. Other nesting waterbirds such as cormorants and herons can be found at the park. Families benefit from the refuge, especially those with school children. “I think the number one selling point is that visitors of all ages can enjoy nature,” Gallion said. Schools book field trips to the refuge, and in the summer youth groups and organizations access the educational and recreational value of the refuge. Every summer, kids receive great door prizes when they participate in Kids Fishing Day. Often people enjoy the best of the region by camping at the Little Missouri State Park, north of Killdeer where they experience the North Dakota Badlands and Grasslands. Then, with a short drive to Lake Ilo, they are immersed in an entirely different ecosystem – the prairie of the Northern Plains. Lake Ilo National Wildlife Refuge is one-mile west of Dunn Center, along Highway 200. The headquarters is on the southeast side of the lake and is open 8 a.m. to 4:30 p.m. The Lake Ilo Park is on the north side of the lake where visitors are free to use picnic tables, charcoal grills, and a restroom. The Park is the trailhead for the one-mile long nature trail, an interpretive trail that winds along the northern edge of the lake. There’s no camping at Lake Ilo, so its hours are generally sun up to sun down. Let us know of your experience at Lake Ilo. Are there other similar hidden get-aways that we should check out? Do you bird watch? Have you checked out the Wildlife Refuge? If you want something more exciting, if rugged, heart-stopping drop-offs and trails are your thing, north of Lake Ilo 50 miles is the most rugged region of North Dakota, Little Missouri State Park. 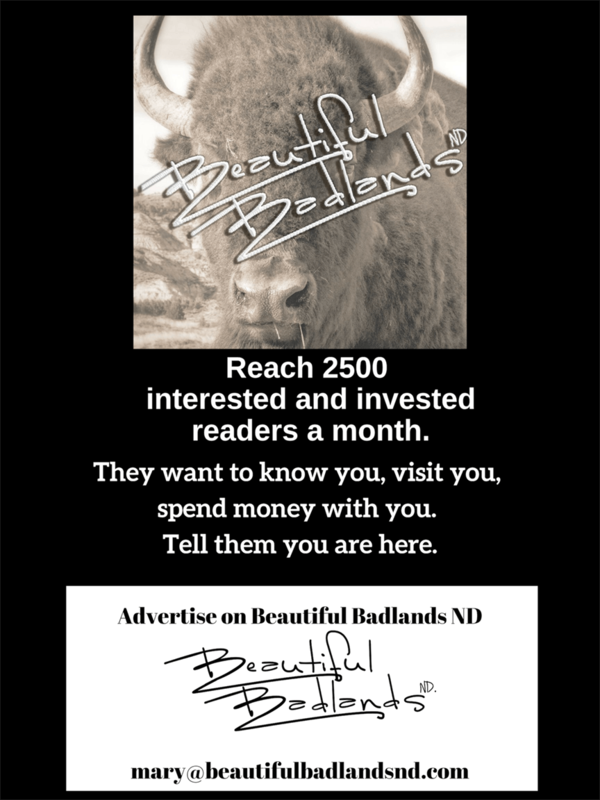 Get a note in your inbox when a new article on Beautiful Badlands ND has been posted. Subscribe.